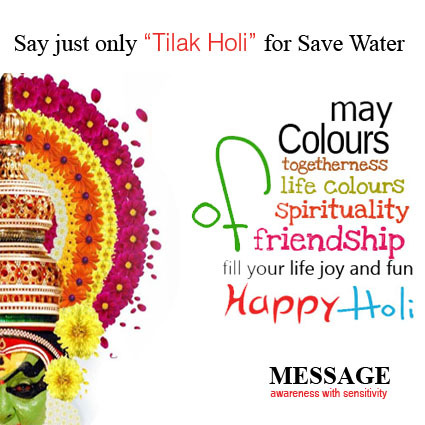 Why Tilak Holi Here are some facts about water. 75 % of our earth is covered with water yet 1.4 billion people live without clean drinking water • Two-fifths of the world’s population lack access to proper sanitation • More than one-third of Africa‚ population lacks access to safe drinking water • 97 % of earth’s water is in the oceans. Only 3 % of the earth’s water can be used as drinking water. 75 % of the world’s fresh water is frozen in the polar ice caps. Water covers 75 per cent of the Earth’s surface — 97.5 per cent of that is salt water, only 2.5 per cent is freshwater. Icecaps and glaciers hold 74 per cent of the world’s freshwater. Almost all the rest is deep underground, or locked in soils as moisture or permafrost. Only 0.3 per cent of the world’s freshwater is found in rivers or lakes. Within 25 years, half the world’s population could have trouble finding enough freshwater for drinking and irrigation. Currently, over 80 countries, representing 40 per cent of the world’s people, are subject to serious water shortages. Conditions may get worse in the next 50 years as populations grow and as global warming disrupts rainfall patterns. A third of the world lives in water stressed areas where consumption outstrips supply. West Asia faces the greatest threat. Over 90 per cent of the region’s population is experiencing severe water stress, with water consumption exceeding 10 per cent of renewable freshwater resources. One in six people still have no regular access to safe drinking water. More than twice that number (2.4 billion people) lack access to adequate sanitation facilities.